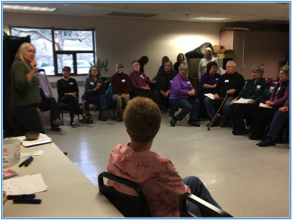 The Shoreline Communities Rising (CR) group will meet at the Shoreline Senior Center from 12:00 to 2:00pm on Sunday, April 2nd, 2017. The Center is at 18560 1st Ave NE, the southernmost building on the Shoreline Center campus. Shoreline Communities Rising! is a non-partisan neighborhood action group, with a stated mission of "Helping each of us become the activist we want to be, while shaping a future that works for everyone." At the March 5 meeting, about a dozen working groups shared information about what they have discovered and explored from topics identified at previous gatherings. Other working groups can arise from the interests of those who attend the meetings. Based on input from all in attendance and from a recent email survey, next steps are being determined. The focus of the April meeting will be shifting toward creating actions designed to address some of the many challenging issues (see above) facing our community and the larger world around us. Rob Beem, City of Shoreline's Community Resources Manager, will be speaking at this meeting, to discuss ways that CR and Shoreline can perhaps collaborate on issues important to all of us, particularly meeting the needs of our most vulnerable citizens.